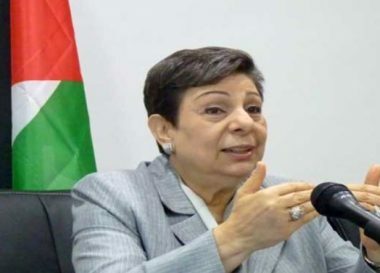 Palestine Liberation Organization Executive Committee member Dr. Hanan Ashrawi condemned, on Thursday, Israeli attacks against Palestinian political prisoners, calling them “cruel and unconscionable”. On January 21, Israeli military prison authorities carried out a vicious attack against Palestinian political prisoners, including child detainees, at the Ofer military prison in the occupied West Bank. The attack included firing rubber-coated steel bullets, stun grenades, and teargas inside the locked cells. Israeli soldiers also subjected child prisoners to abuse and humiliation, including unleashing attack dogs against them while they were forced to stand facing the wall for hours with rifles pointed at them. At least 150 prisoners were injured, with 25 requiring hospitalization. In addition to the cruel attacks, Israeli military prison authorities denied Palestinian prisoners the right to receive needed medical treatment for their injuries at hospital for three days. Tensions remain high and punitive measures against detainees continue. “Ongoing Israeli attacks against Palestinian prisoners, including child prisoners, are cruel and unconscionable,” said Ashrawi in a statement, according to WAFA. “The escalating situation comes in the context of systematic efforts by the Israeli government to vilify and incite against Palestinian political prisoners while taking additional punitive measures that exacerbate the dismal and illegal conditions of their detention. Six thousand Palestinians are imprisoned by Israel, including 700 suffering from chronic illnesses and 230 children. They endure systematic violations of their most basic human rights, including torture and other forms of maltreatment,” she said. The PLO official called for an end to Israeli measures against Palestinian prisoners and for international bodies to ensure Israel respects human rights. She also called on her to speak on behalf of Palestinian prisoners, specifically victims of torture and other forms of ill-treatment, and defend their inalienable right to life, dignity, and safety. “I urge all states and champions of human rights to speak up on this issue and hold Israel accountable for its documented and demonstrable human rights abuses. Continued international neutrality is an irresponsible and unacceptable disservice to the rights-based international system,” Ashrawi concluded her statement.